We asked: Who’s your nursing superhero? Who’s the nurse who made all the difference to you? Your role model, your dream colleague, or simply the nurse you admire most? You responded, and how! You sent in an impressive range of submissions — moving stories, inspiring stories, colorful stories, and above all: heartfelt stories. We will be proud to share a selection here on this blog over the next few weeks. 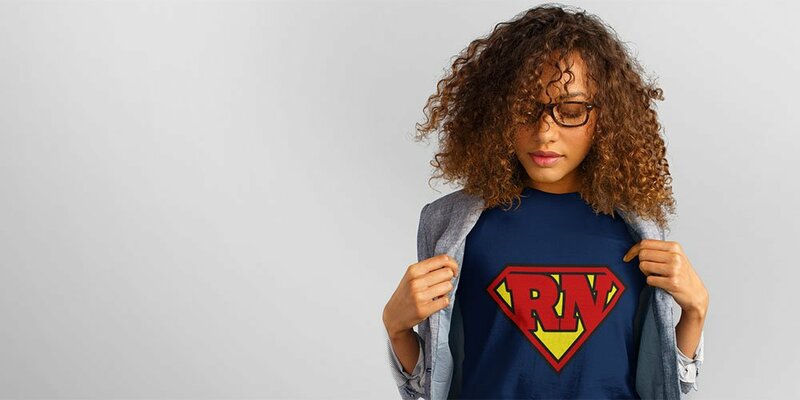 And of course: for every story we publish, we will send out an amazing, Superman-inspired “RN superhero” t-shirt from our brand new Nurse Swag site! We are kicking off this series with a truly touching story, with a hint of mystery. Larry Bass wrote us to explain how, at age 42, after twenty years in the restaurant industry and three open heart surgeries, he decided to take his life in a very different direction, go to nursing school and become a Registered Nurse. What moved him to do so? The inspiring example of Pat, the wonderful nurse who’d cared for him through his ordeal. Larry wrote: “I am ashamed I don’t even know her last name, but I have never forgotten her, and the kindness and care she provided for me”. If anyone deserves a Super-RN t-shirt, it’s Pat! Wouldn’t it be amazing if she knew what difference she made for the patient she cared for so diligently? Maybe you can help find her! Do you know anything that could lead us to Pat, who worked as ICU nurse at Catholic Medical Center in Manchester, NH, in 2002? 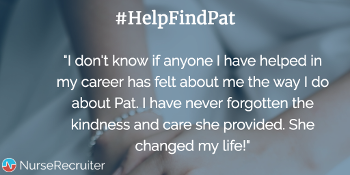 Tell us, or share this story and tag it #HelpFindPat — maybe together we can let her know! In 2002 I was a twenty-year veteran of the restaurant industry. After months of suffering from a chronic cough, I was diagnosed with a severely prolapsed mitral valve. At 42, I was facing open heart surgery. After undergoing open heart surgery on October 31, 2002 (Happy Halloween! ), I awoke in the intensive care unit to a face I had never seen. Her name was Pat. She was an ICU nurse at Catholic Medical Center in Manchester, New Hampshire. Pat changed my life. You see, this was only the beginning of Pat’s impact on my life. By the time I met Pat, it was three days after my surgery, because I was in a medically induced coma for three days following my twelve-hour procedure. During those three days, while I was out, my then-girlfriend decided that she was unable to handle what was going on, and moved home to Massachusetts. I was unable to talk as I was still intubated, and Pat had to explain to me that she would not be coming back. Pat wiped the tears from my eyes, and spent every second of her night with me. As luck would have it, I had a complication, and developed a pericardial effusion. This led to a second open heart procedure to do a pericardial window to allow fluid to drain from my pericardium — and all the while, there was Pat. Helping me with the pain, both emotionally and physically. During week three, my pericardial effusion had not resolved. It had become loculated, and there were areas of the pericardium that would not drain. When my surgeon told me at three in the morning, in my dark ICU room, that I would have to undergo a third open heart procedure, I broke down. The only one who was there for me was Pat, and she stayed by my side all night. The next morning I underwent a partial pericardiectomy. This was the third time my chest was cracked, and the third time I was on a ventilator. I made Pat promise before my third surgery that she would get me off the ventilator as soon as she possibly could. Naive on my part, as I was lucky to even survive the procedure — but when I did wake up, there was Pat, pushing me to take breaths. Within five hours of being out, they were extubating me. I finally stabilized, and was transferred to a Step Down Unit for two weeks until I was discharged. Pat visited me in Step Down every shift she worked. As you can imagine, going through a three-month recovery period from something like that gives rise to a lot of soul-searching. I was not satisfied with my career prior to all this, and I began to think about what I wanted to do. It was at that point that I realized: if I could have just one person think about me the way I did about Pat and what she did for me, then that would be all the legacy I could ever ask for. So I left the restaurant business, and went to nursing school. First as an LPN, and then finally as an RN. I have been a nurse since 2004. I don’t know if anyone that I have helped in my career has felt about me the way I do about Pat. I am ashamed I don’t even know her last name, but I have never forgotten her, and the kindness and care she provided for me. She changed my life! Pat, wherever you are, Thank You! If you feel inspired by any of these contributions to tell us about your own “super-nurse”, don’t worry! The contest remains open. Just send your story to contest@nurserecruiter.com, and make sure to include your name, the name of your nursing superhero, the size and color the shirt should be, and the shipping address you’d like it sent to.